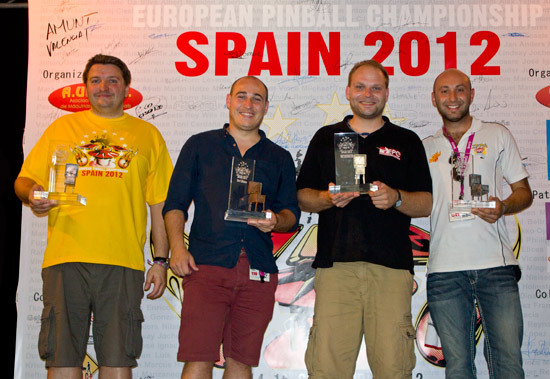 The European Pinball Championship is hosted by a different country each year, and for 2012 it was the turn of the Spanish pinball community to take the reins and organise Europe's premier tournament. 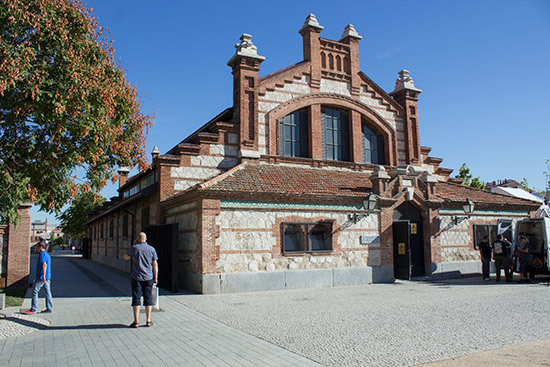 The venue chosen was a municipal hall at the Matadero complex in southern Madrid. Finding it proved to be a little difficult with no signs to help, but as we searched the complex we chanced upon a contingent from Belgium who had already found the building and were getting in some early practice for the weekend ahead. As you can see, the weather was perfect with clear blue skies and temperatures peaking at about 32°C (90°F) in the mid-afternoon. Those temperatures made it pretty warm inside the building at times, but the high ceilings and electric fans on the floor ensured it never got too uncomfortable. 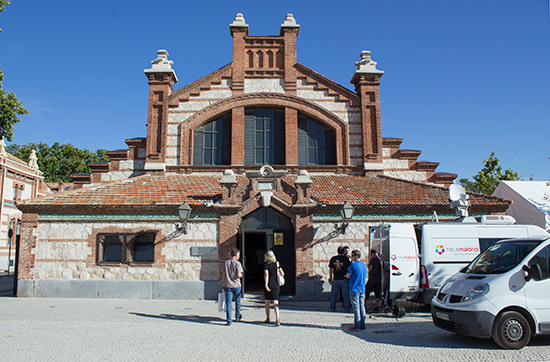 The hall was split into five areas for the EPC. 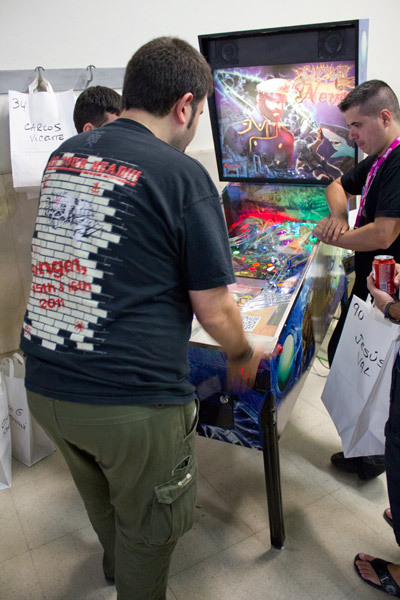 As players arrived through the single entrance, they found a practice area with DMD machines on the right side of the hall, and a second practice area with EM and early solid-state machines on the left. 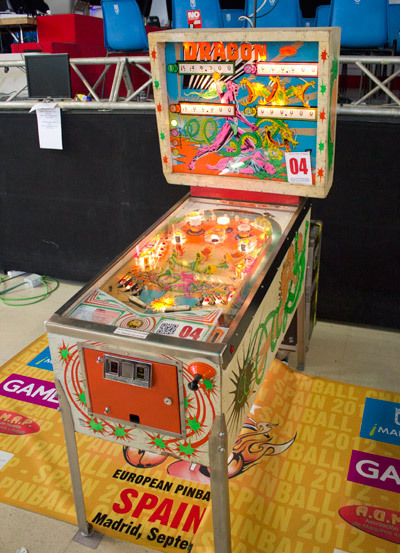 Mixed in amongst the classic practice machines was the Captain Nemo machine from Quetzal Pinball. Game designer Antonio was there to answer questions and he told us there had been many small changes made to the game since its last appearance and there has also been a major re-write of the software framework to improve the gameplay experience. 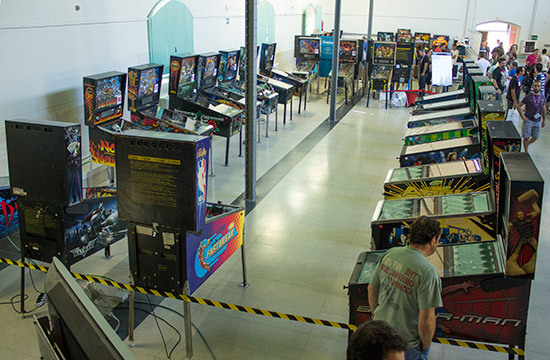 We'll have more on the changes made so far and those yet to come soon here at Pinball News. 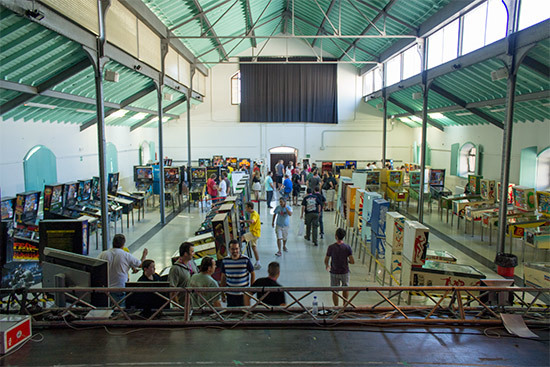 In the centre of the hall were the two main tournament areas. 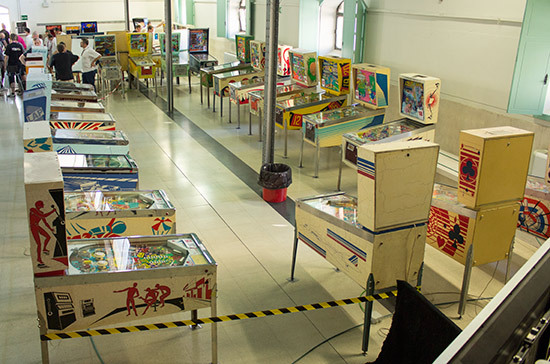 On the left were the machines for the Classics Tournament, while on the right were the main EPC machines. 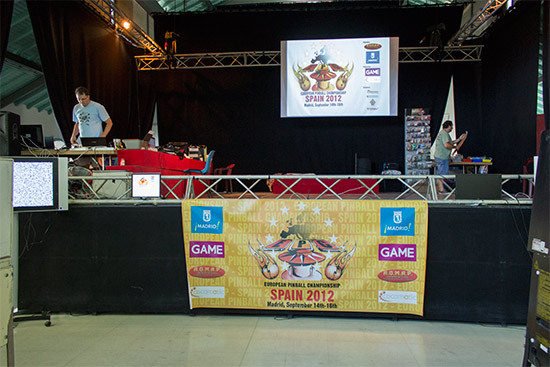 Finally, at the back of the hall was the stage where the tournaments' computer systems were located and the various presentations were made. 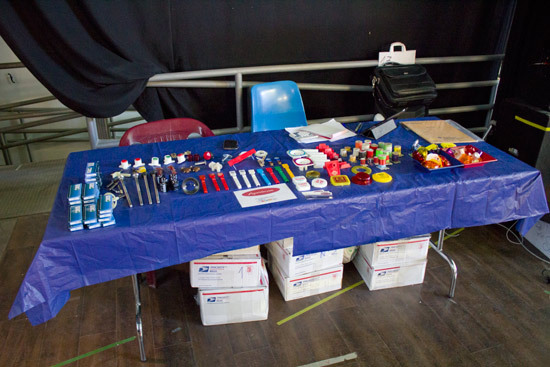 In addition, two vendors were set up on the right side of the stage. 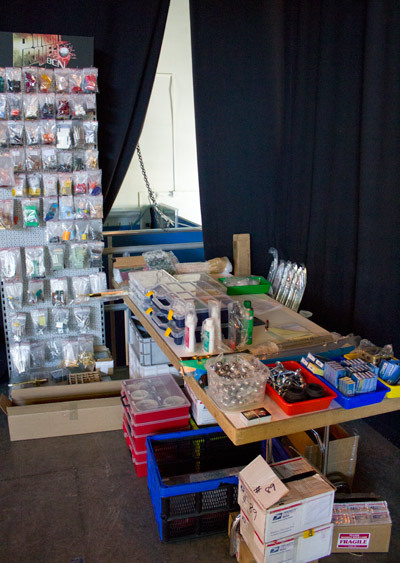 Pinball Project had a good-size stand with many common pinball parts and cleaning materials, as well as a rack of grab-bags containing flasher domes, flippers, plungers, fuses, lane guides and buttons. Next to them was a stand from Fugarolas.com with a smaller selection of plungers, drop targets, lamps, coils and bumper caps. Flanking the stage were two monitors showing the current progress in the two competitions, although the Classics scores were on the monitor on the right of the stage next to the EPC machines and the EPC scores were shown on the monitor next to the Classics tournament which seemed slightly odd. Also at the front of the stage was a webcam which allowed players to scan their badge's QR code and view information about their performance. The scanning process and information was rather hit-and-miss, but it was a useful addition to the details shown on the monitors. Finally, a large screen above the stage showed overall tournament positions. Let's take a look around the EPC with our unique Three Minute Tour - a video walk around the hall on Saturday afternoon, letting you experience the games, the competitors, the facilities and the sounds for yourself. The first event was the Country Tournament which was played on Friday evening on a selection of the main EPC dot matrix machines. 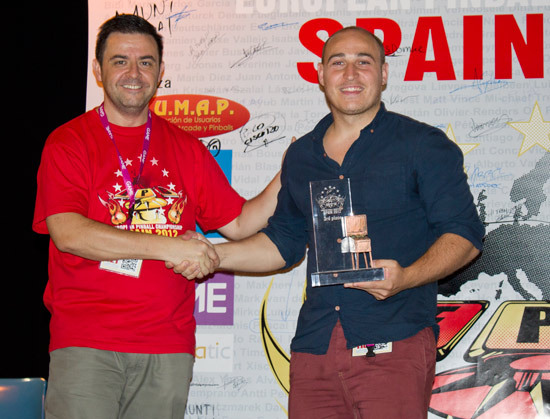 Entry to the Country Tournament cost €40 per team of four, and was limited to one team per country, with a maximum of twelve teams taking part. The team captains were assembled at around 7pm and the rules explained to them so they could relay them to their compatriots. 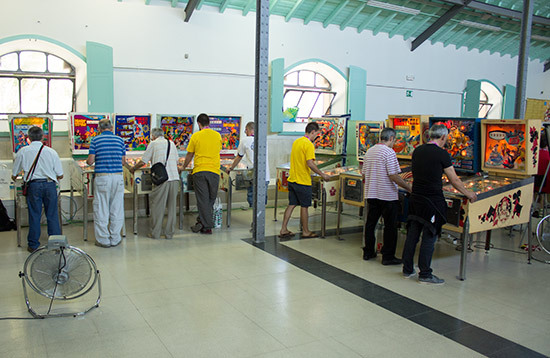 The twelve teams were split into two groups - A & B - and each team played a single 2-player, 4-ball match against every other team in their group. 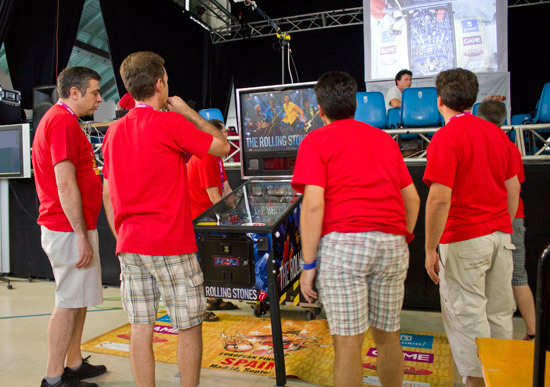 In the matches, each player played one ball for their team and the team with the highest score at the end earned 2 match points. When all matches had been played, the two teams with the most match points in each group would go through to the semi-finals. Once the organisers were ready, the first matches got under way at around 8pm. Poland went through to the semi-finals ahead of the United Kingdom because, despite having the same number of points, Poland had won the head-to-head match between the two countries. The semi-finals pitched the winners of each group against the second place in the opposite group. So Hungary played Switzerland and Belgium played Poland. 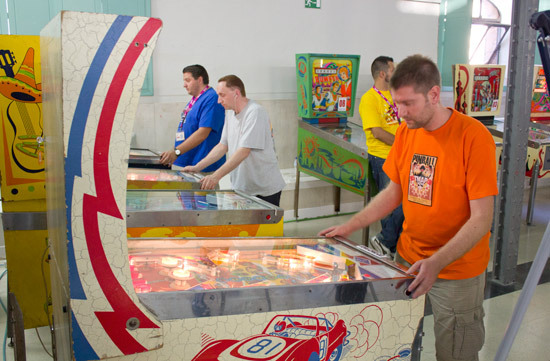 Both the group winners also won their semi-final matches, making the final a play-off between Hungary and Belgium played on four machines; Junkyard, Monster Bash, Terminator 3 and The Flintstones. 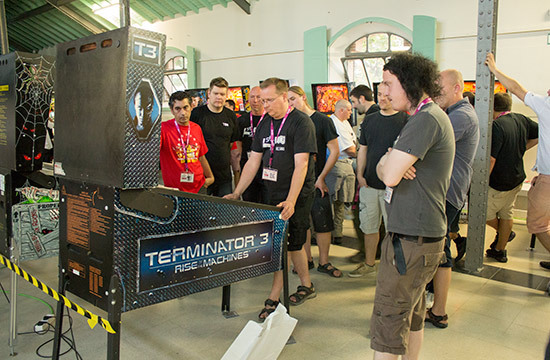 The Hungarian team had comprehensive wins on Junkyard and Monster Bash, but the Belgian team turned it around on Terminator 3. However, the team from Hungary took another solid win on The Flintstones to win the final 3-1. In the play-off for 3rd and 4th, Poland beat Switzerland on Spiderman. Only Country Tournament players were officially allowed into the hall on Friday evening. For everyone else, the EPC didn't open until Saturday morning. 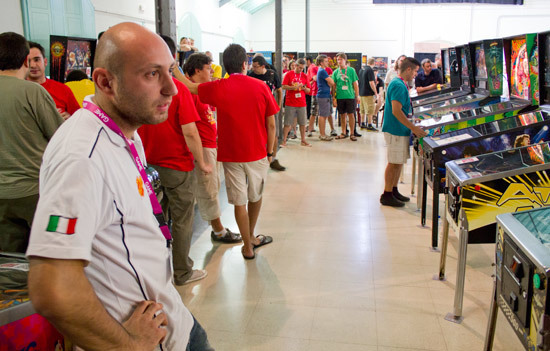 At the appointed opening time only player sign-ins were permitted, and it was some time before registered players could get into the hall and get some practice ahead of the qualifying rounds for the Classics and the main EPC tournaments. 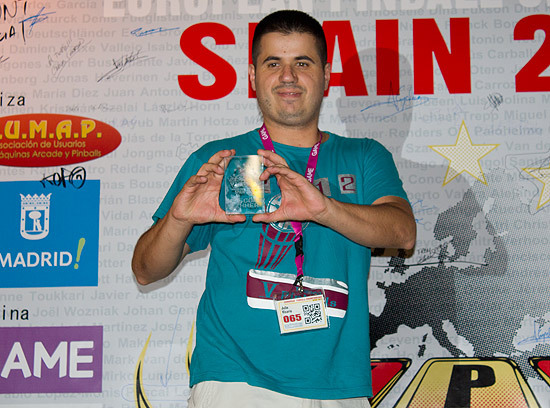 Entry to the EPC was by pre-registration which cost €60 and gave players one entry to both the EPC and the Classic Tournament. In addition, they also received a welcome pack containing a T-shirt, a fridge magnet, a pen, as well as a scoring card for personal use and a personalised badge. 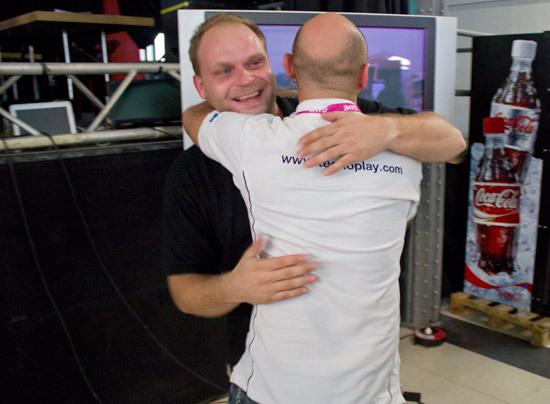 Both the EPC and the Classics Tournament followed the same format. 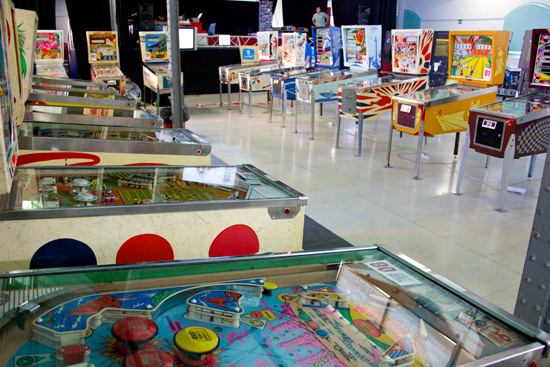 Players could choose any six from the eighteen available machines and play a single game on each of them. 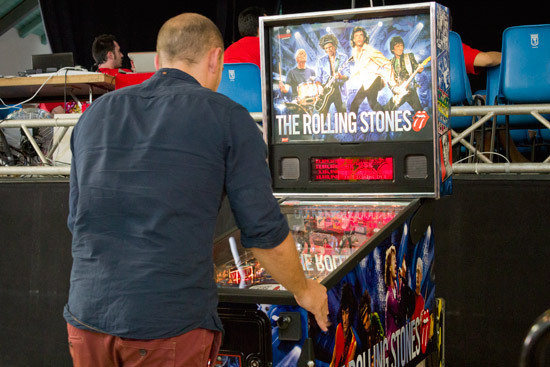 All the scores on each machine were ranked with the top score earning the player 100 points. The sum of their points from their six games made up their final ranking points total. 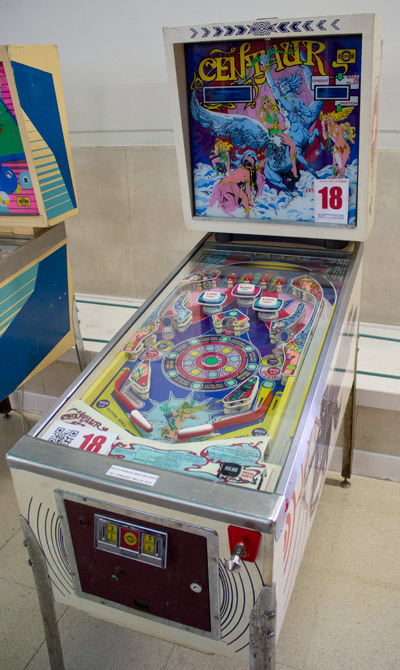 All the Classics Tournament machines were from Spanish manufacturers and made for the Spanish market, although the names were mostly in English with less-than-convincing translations such as Luck Smile, Stripping Funny and Sea Scare. 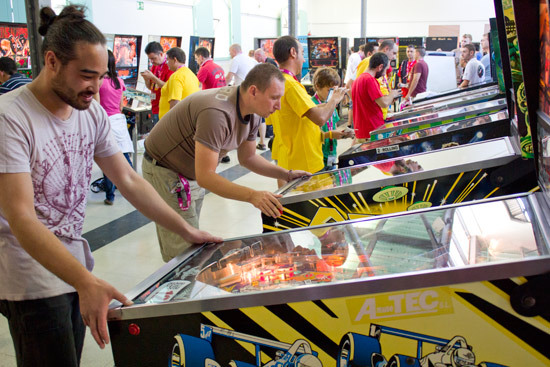 It was certainly fun to see and play some machines which are almost unknown outside Spain. Centaur - no, not that one. This one's from Inder. 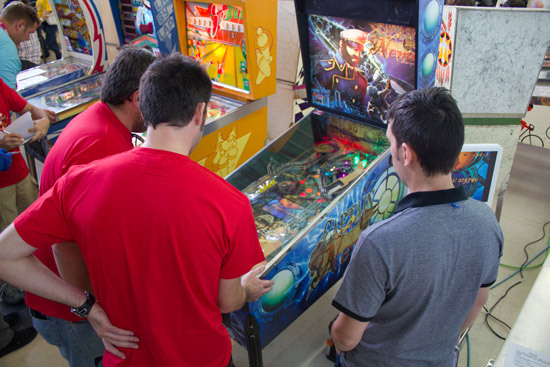 The points structure was fixed so that the second best score on a machine would always earn 90 points, the third 85 points, the fourth 80 points and so on, regardless of how many had played it. 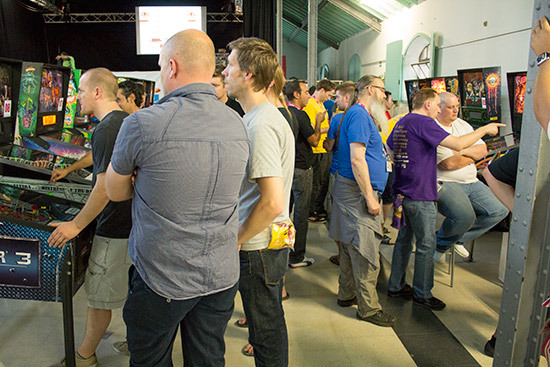 The top 45 players earned points, so if fewer than 45 had played a machine by the end, everyone who played it would receive at least some points. This produced the anomaly where someone who came halfway down the rankings on NBA Fastbreak would get 32 ranking points, whereas someone who got the same position on a popular game such as Medieval Madness could get 10 or fewer (or possibly zero) points. 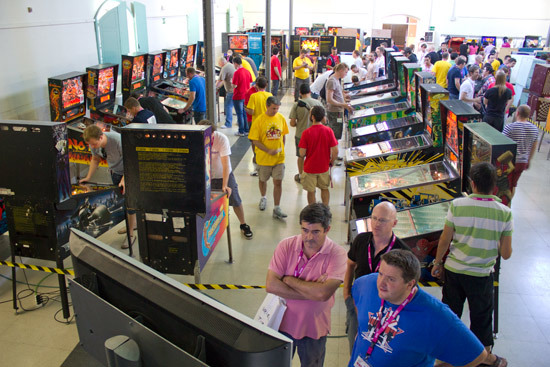 Both tournaments also included the Joker system introduced at the UK's EPC in 2009 where players could replay one of their six games in an attempt to improve their score. If the second attempt was better, the new score replaced the old. Otherwise, the original score stood. The rules were explained to players - first in Spanish and then in English - just before play began on Saturday morning. 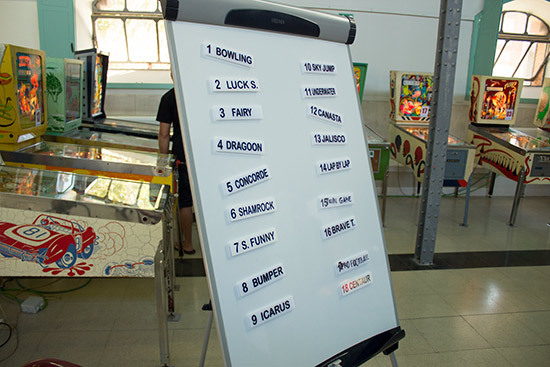 To regulate the queues for machines and to ensure only those actually playing games were allowed into the play area, both tournaments had a board on which magnetic signs bearing the names of the machines were placed. 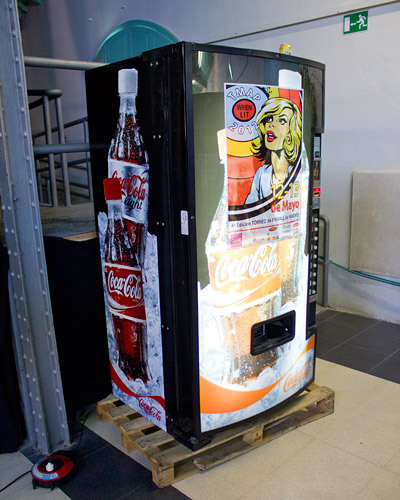 Players could pick up a sign and play the machine. Then, when they had finished, they returned the sign to the board for the next player to pick up. 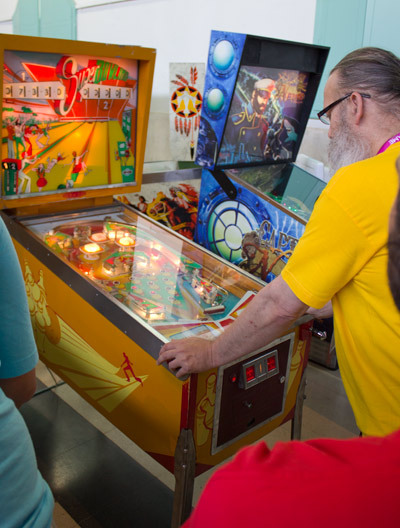 In both areas, tournament officials opened the coin door and added a credit to the machine so a competitor could play their qualifying round game. This was designed to combat cheating so nobody could surreptitiously start a second game if they had a bad score. However, there was still quite a high level of cheating taking place. They were able to do this because when an official was summonsed, they usually asked if you wanted to start your game or have the score recorded. An unscrupulous player with a bad score would just ask to have their game started, as most officials had no idea whether they had previously played it or just arrived to start playing. 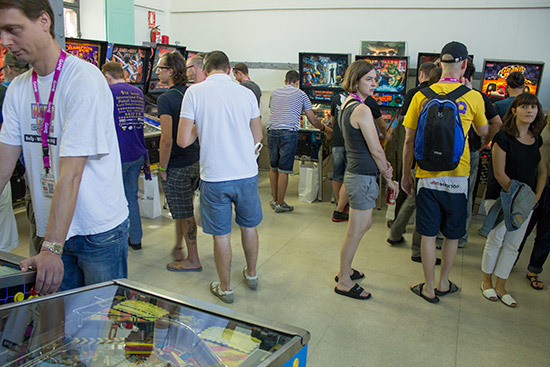 Several people said they saw the same competitor play the same machine three times which was very disappointing. 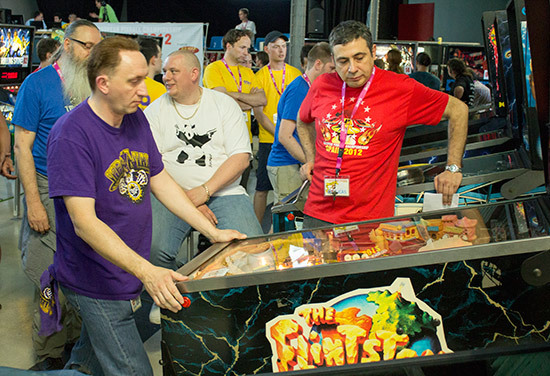 Classic Tournament players had until 8pm to complete their six games and play their joker. EPC players had another two hours - until 10pm. Only when the qualifying finished were the 32 qualifiers for each tournament announced. 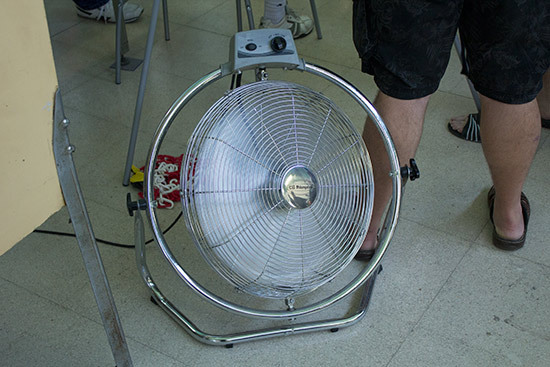 With 18 EPC machines, 18 Classic machines, around 2 dozen practice machines, around 150 players and temperatures hitting 32°C (90°F) outside, there was one machine which everyone enjoyed. The Classic Tournament played its first round of play-offs while qualifying for the EPC finished on Saturday night. This reduced the number of players from the initial 32 qualifiers down to just eight semi-finalists. 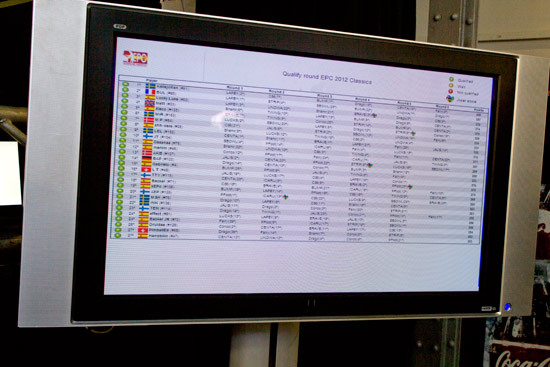 The EPC would follow the same format when it picked up the next morning which allowed the 32 qualified players to choose any three from the eight available machines to collect ranking points. This time there was no joker and the machine selection was changed, with some previously-unused models brought in. So the next day's Classic Tournament semi-finals would feature four Spaniards, two Britons and two Swedes. Once the day's excitement was over, everyone could leave the venue and go outside to enjoy the very pleasant evening, and sample some of the food and drink available right outside the hall where a large fun fair and festival was set up and continued into the small hours of the morning. 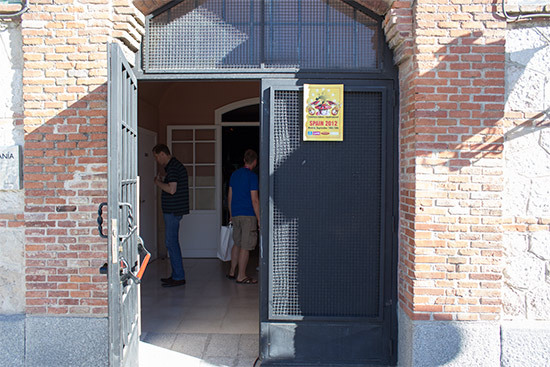 The last eight in the Classic Tournament were told to be back at the hall by 9:15am for the start of their semi-finals. This proved unnecessary however, as nothing happened in that tournament until nearer midday. It was the EPC which began its play-off round first with the 32 qualifiers playing their three games to be reduced to 8 for the semi-finals. Both tournaments could then play their semi-finals. Here the rules changed with the eight players split into two groups of four. 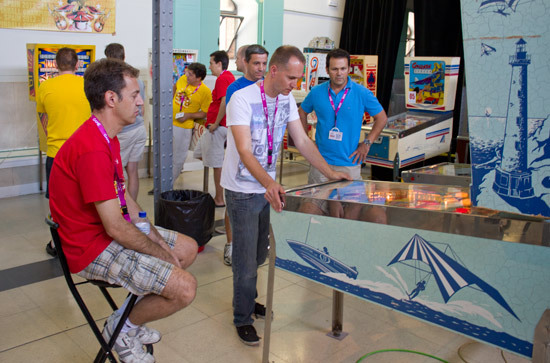 Both groups played a 4-player game on two machines. One group started on one machine and the second group on the other. They then swapped machines to play their second game. 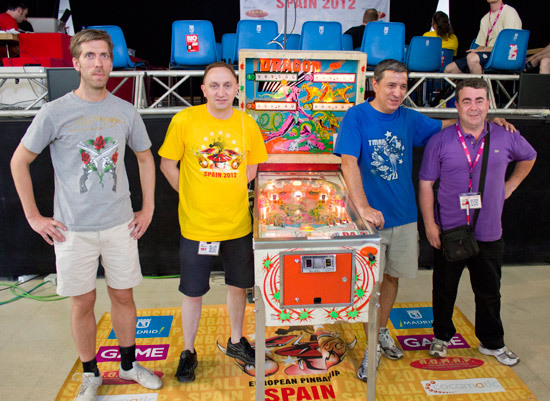 The winner of each four-player match earned 9 points, the second place got 5 points, third place earned 2 points and fourth place didn't score any points. The two players with the most points in each group then went into the final. 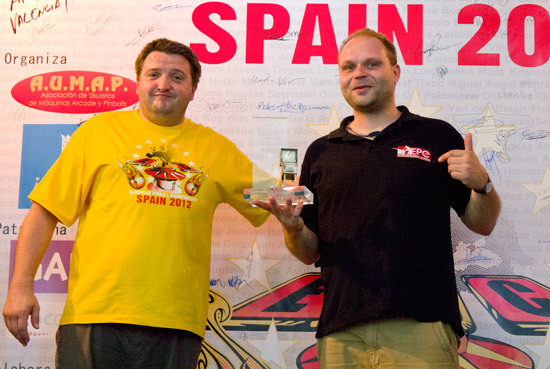 So Jörgen Holm, Juan Escuder, Peter Blakemore and Francisco Núñez would contest the Classic Tournament final. That meant Franck Bona, Levente Tregova, Danielle C. Acciari and Craig Pullen would play in the EPC final. 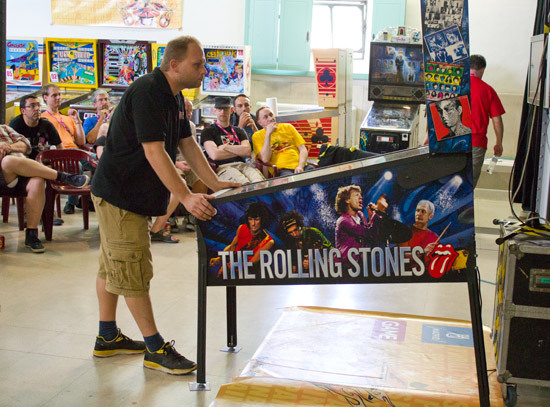 For those who didn't qualify for either tournament, there was still some competitive pinball to be played on Sunday as three side events took place in the Classic Tournament area. 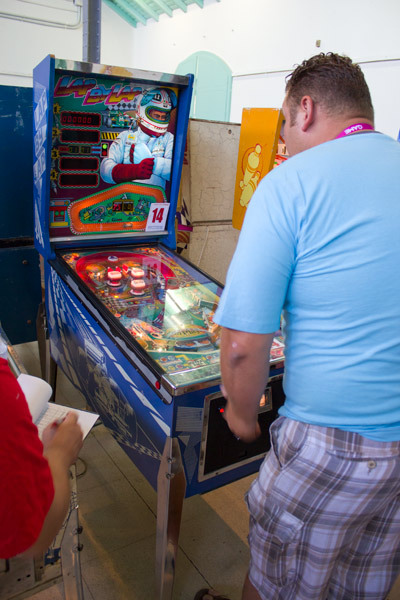 There was a straight high score competition on the Lap by Lap machine, a 'closest to the score' on Super Bowling and a split-flipper contest on Captain Nemo. 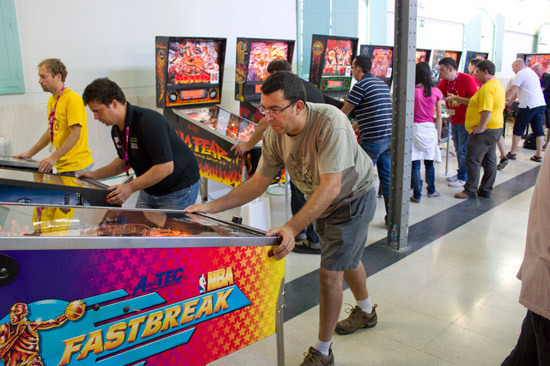 Visitors could play one attempt on each machine to try to win a trophy for first place. 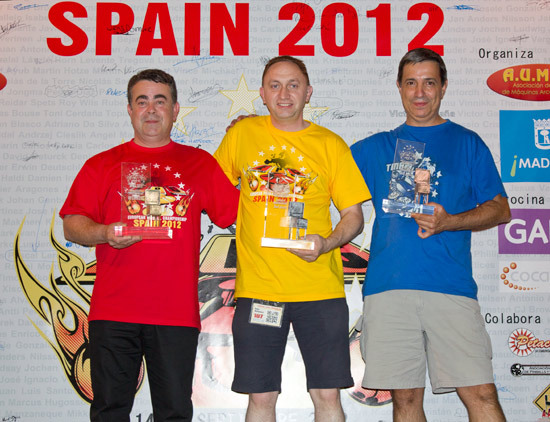 Then it was time for the culmination of the weekend's events as the finals for the two major competitions were held. The Classic Tournament final took place first. This would be decided by a single four-player game on the Inter Flip machine, Dragon. 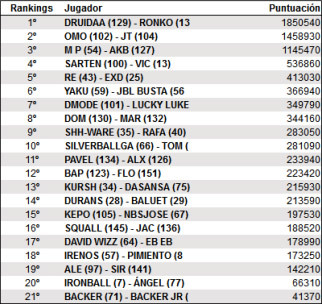 Going into the fifth and final ball, Francisco was in the lead with 383,500 ahead of Juan's 249,600 with Peter's 248,400 narrowly behind and Jörgen's 151,800 in fourth. 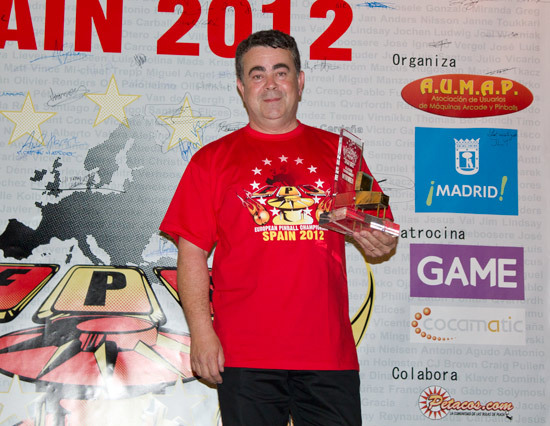 Peter was playing first and boosted his total score up to 359,700, putting him in second place. Jörgen added just under 77K to his score to finish on 229,500 which was still fourth place. Juan didn't get a chance to add much to his score, ending the game on 254,600. All of which left Francisco not needing to play his fifth ball as he had already won. He did have a quick play though and increased his score to 408,900 before the ball drained and he could celebrate his victory. So Francisco was first, Peter second, Juan third and Jörgen fourth. Then it was time for the main EPC final which was to be played on The Rolling Stones. 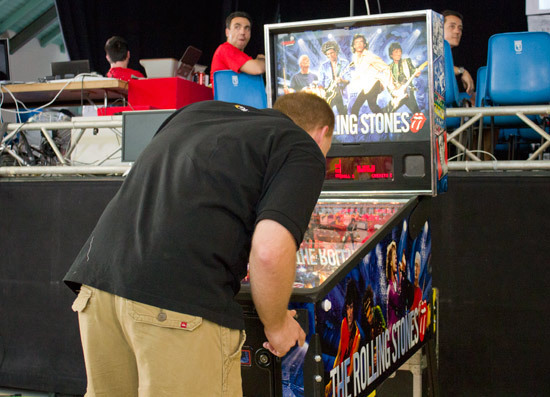 It was hoped to use a new X-Men for the final, but it was held in customs in Spain and didn't make it to the EPC in time, so The Rolling Stones filled the void. 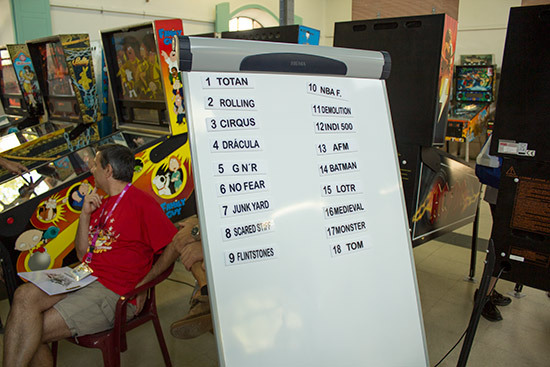 As with the Classic Tournament earlier, there was a video camera set up over the playfield with the output shown on the large projector screen. 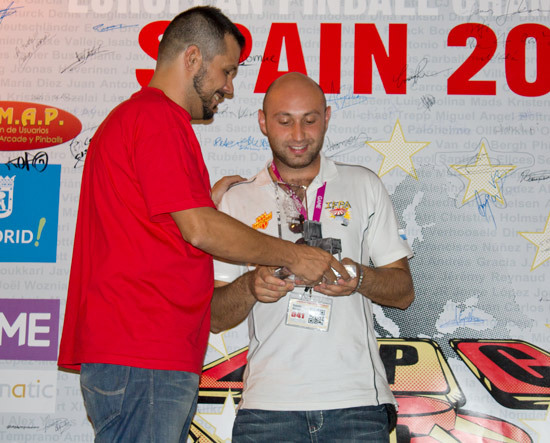 Levente started the final as player one in the four man final. Levente rack up a decent 7,910,060 with his first ball. Craig played second and scored 2,067,330. Franck was third to play but only managed 1,423,090. Danielle was last to play but his first ball drained very rapidly to leave him with a score of just 855,740. Craig was the main beneficiary from the round of second balls, boosting his score up to 9.4M and giving him a slender lead over Levente's 8.7M, with Danielle on third with 2.5M just ahead of Franck's 2.4M. Ball three saw a comeback from Danielle as he started Album Multiball and ended on 10.6M, just ahead of Levente's 10.2M, but Craig was still in the lead with 13.9M. Franck was having a nightmare with little chance to make an impact while languishing back in fourth on 3.3M. The penultimate ball re-established Levente's lead as an impressive multiball pushed his score up to 23.9M. Craig kept in the chase with his score of 16.5M. Franck was finally given a chance and increased his score to 12.1M to put him in with a chance on the final ball. Danielle also put on a spurt and raced up to 20.4M, setting up an exciting final ball. 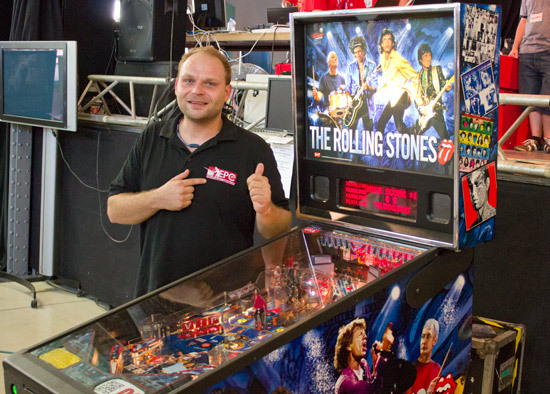 A Rock Star Multiball for Levente allowed him to race ahead and finish his final ball with a total of 38,528,140 points, almost double his nearest challenger's score. Craig was able to add 7M with his fifth ball to end on 23,688,030. 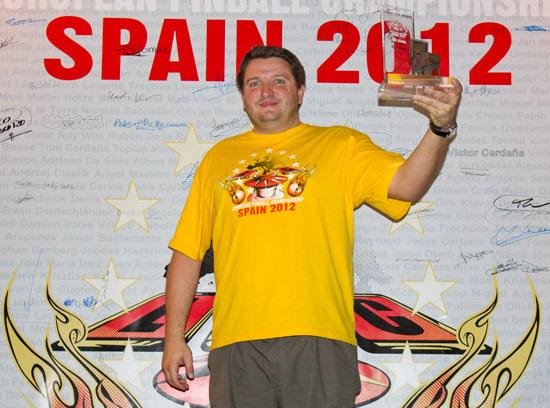 Franck's bad luck returned with his fifth ball as he was only able to raise his score to 13,092,700. Which left only Danielle with any chance of overtaking Levente's 38M score. 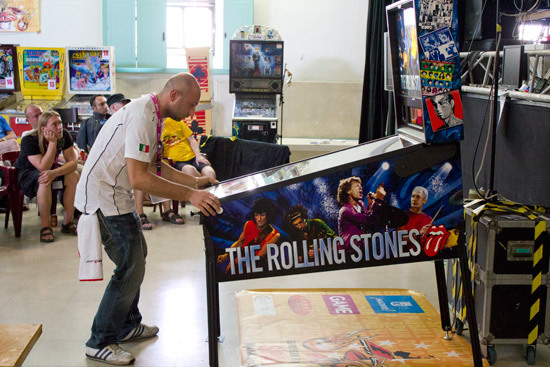 He chose to go for Album Multiball, but an unkind bounce sent the ball to the drain with a total score of 25,537,470, making Levente the new European Pinball Champion. Then it was time for the presentation of the awards for the main EPC tournament. 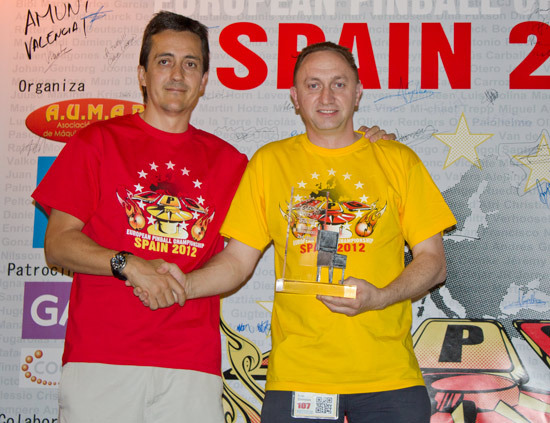 And with that we end this report from the 2012 European Pinball Championship in Madrid. 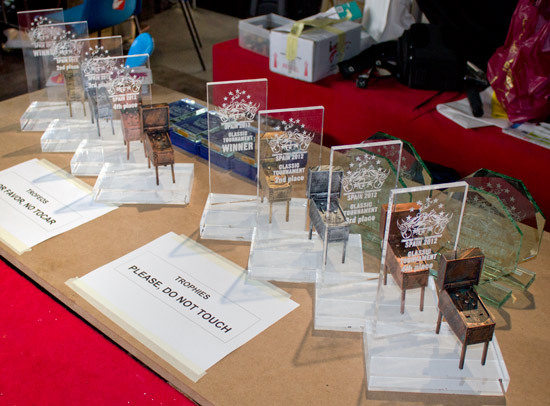 Congratulations to the organisers on hosting a successful event, with no major issues and a collection of machines which held up well to a weekend of punishment. The venue was a good one, and the surroundings with the parks, fun fair, and festival atmosphere really helped make it a thoroughly enjoyable event, as did the great weather and friendly staff. 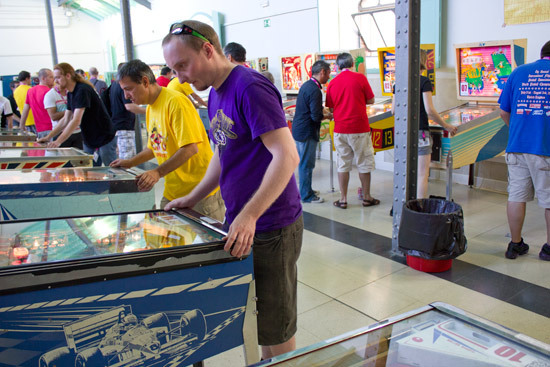 Next year's venue for the EPC is still under discussion, but we will be sure to announce it in the Pinball News Diary just as soon as details are confirmed.